If you haven’t yet heard about all the great benefits of olive oil, then you’ve probably been living under a rock. Olive oil has many advantages when it comes to cooking, but there are other creative uses for olive oil outside of the kitchen. Because of its high content of polyphenols and oleic acid, extra virgin olive oil provides more benefits than you might think. 1. Cut Cholesterol: Swallow a tablespoon of olive oil a day to manage bad cholesterol. 2. Oil Garden Tools: Clean garden tools with olive oil to keep them flexible any without buildup. 3. Treat Diaper Rash: Gently rub a small amount of olive oil into rash to get baby’s skin feeling smooth again. 4. Remove Gum: Rub olive oil around area where gum is stuck and slowly work it out. 5. No More Sticky Dough Hands: Lube hands with olive oil to keep dough from sticking to skin. 6. Prevent Hairballs: Squirt a few drops of olive oil onto pet food to help prevent hairballs. 7. Treat Cracked Paws: Rub a little olive oil onto cracked paws to ease Fido’s discomfort. 8. Apply to Flea Bitten Skin: Ease tenderness by applying some onto the flea bites. 9. Shine Shoes: Use a few drops of olive and a clean rag to make shoes shiny again. 10. De-Lice Naturally: Coat lice infestation with olive oil, comb out agitated lice and then let oil sit for 6-8 hours under a shower cap before rinsing with vinegar. 11. Face Moisturizer: Mix 1/4 teaspoon of olive oil and 1/2 teaspoon of lemon juice for a DIY face moisturizer. 12. Soften Cracked Feet: Massage olive oil into the bottoms of feet and slip on a pair of cotton socks until the oil is absorbed. This makes for an instant at-home spa. 13. Remove Stickers: A drop of olive oil is all it takes to remove stuck on wall stickers when the time comes to change the decor. 14. Stop Frizzy Hat Hair: Comb a small amount of olive oil into hair before wearing a winter hat for a look that will stay in place without flyaways. 15. Remove Ear Wax: Soak the corner of a washcloth in warm olive oil and carefully clean ears to remove hardened wax. 16. Remove Dead Skin: Rub a fair amount of olive oil onto dry areas of skin followed by sugar to slough off dead skin. This can be coupled with dry brushing to exfoliate. 17. Smooth Shave: Prevent razor burn and get a closer than ever shave with olive oil. 18. Stop Snoring: Try moisturizing the throat with a little olive oil before sleeping to help stop snoring. 19. Remove Paint from Hands: Vigorously rub olive oil onto your soiled hands and easily wash the paint away. 20. 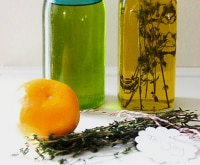 Acne Fighter: Make a paste out of olive oil and salt and apply to face. Add a little brown sugar for a great body scrub. 21. For Better Nails: Rub a dab of olive oil into cuticles for instant softness. 22. Oil Zippers: Rub a little olive oil on stuck zippers to make them work like new again. 23. Remove Tarnish: Wipe away tarnish with a little olive oil and a clean rag. 24. Leather Conditioner: Use a few drops of olive oil and a clean rag to keep leather conditioned. This works for clothes, furniture and other items. 25. Improve Gum Health: Rinse mouth for 15-20 seconds with olive oil for healthier gums.